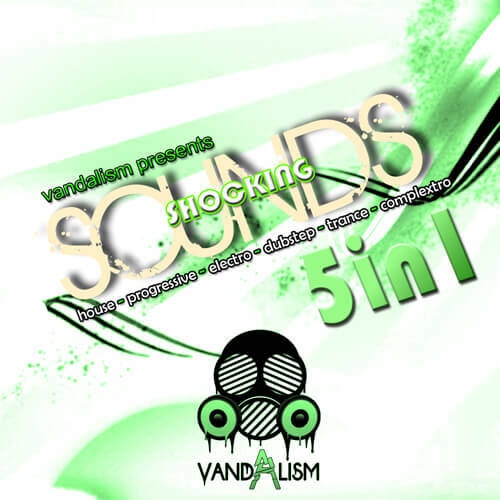 ‘Shocking Sounds 5-in-1’ is a bundle of five Sylenth1 soundsets with 338 presets, including House, Electro, Dubstep, Complextro, Dance, Progressive, Trance and Minimal sounds. Inside you can find presets inspired by today’s top producers and also awesome fresh sounds. With this pack your tracks will be massive! Vandalism, being inspired by top artists like Tiesto, R3hab, Swanky Tunes, Fedde Le Grand, Steve Aoki, Afrojack, Chuckie, Avicii, Porter Robinson, Sidney Samson, Zedd, Bingo Players, Calvin Harris, Sandro Silva, Quintino, Alesso, Avicii, Hardwell, David Guetta, Skrillex, Mat Zo, Will I.am, Britney Spears, Dinka, and many more, brings you the most amazing soundbanks ever! Inside this bundle you can find many fresh and stunning presets to give you the chance to be unique. If you are looking for massive sounds for your favourite plug-in, go ahead and buy this unbelievable bundle made by a professional sound designer. Make sure to check out the other products in the ‘Shocking’ series. Especially MIDI Loops from Vandalism, suitable for these sounds. These soundsets all require Sylenth1 Version 2.2 .